Some genres must be dynamic, but many club-destined styles of dance music have to be loud. 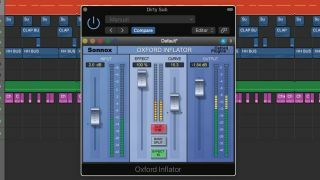 Here are a few modern tools that can help your tracks compete without destroying punch. Pick up the October 2018 edition of Future Music to check out the full Mixing For The Club tutorial. Ableton Live users can fire up the Multiband Compressor’s OTT preset, but all DAW owners can use this freeware downwards/upwards compressor - a modern way to flatten and raise midrange and high end. Use it on drum buses, vocals and full-range synth bass. Download Xfer Records OTT for free. Something of a secret weapon, Inflator can increase the harmonic perception of loudness. Use it to give signals density while retaining headroom. The Curve control defines the harmonic character of added weight. Harmonic saturation can increase the apparent loudness of sounds, but without the transient-destroying side effects that other processes can induce. We’re fans of Plugin Alliance’s delicious pentode/triode tube distortion plugin, which serves up multiple drive colours. An improved frequency balance equates to a louder mix overall. This intelligent plugin listens to the input signal, identifies frequency balance problems based upon typical human hearing, then creates a dynamic EQ curve to match. Dial in the correct amount of high-mid and treble sheen, and your mix will appear louder. Clariphonic, a parallel EQ, is one of the best tools out there for adding expensive-sounding brightness. A limiter caps a signal’s highest peaks, thereby reducing dynamic range and giving you a louder mix. Ozone 8 Maximizer’s IRC IV algorithm is one of the most transparent out there, and the plugin’s Transient Emphasis mode lets you add back more crack. Use with restraint!